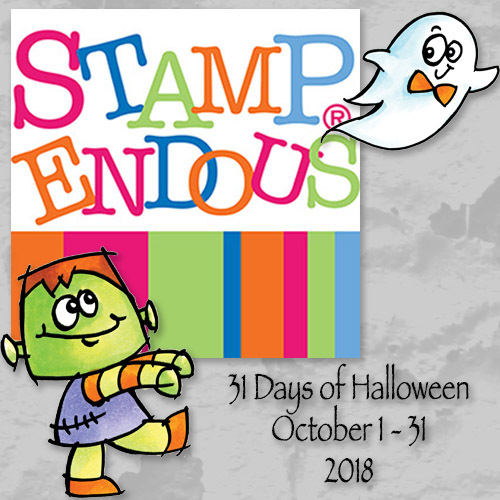 Hey everyone, thanks for joining us during the month for the Stampendous 31 Days of Halloween Blog Hop! To start at the beginning of todays hop please head here!! Today we are making a small hand cream holder. I love Nivea hand cream and greatly appreciate my sister introducing it to me several years ago! I thought it would be nice to make a few for some friends and family for the upcoming winter months ! Starting with a piece of card stock that is 7 1/8 x 3 7/8, score the 7 1/8" side at 2 5/8, 3 1/4, 5 7/8, and 6 1/2. Score the 3 7/8" side at 5/8 and 3 1/4. Head here to see the video I made showing how to trim and assemble this box. Thank you so much for joining us this month for the hop and be sure to head on over to the Stampendous site to get lots and lots of amazing goodies!!! This is a brilliant idea for a halloween treat idea! Those goofy pumpkins are super cute and it looks awesome! What a DARLING treat idea! So cute! Sweet gift box (great video) and what a darling image, love it all. awesome way to present it. So cute! Beautiful fall colors! Love the jack o' lanterns! Such a fun project! Love this! Love, love this little box watched your You Tube video very helpful. This is such a great gift idea I will be giving it a go. I love the way you decorated this box very cute tfs. Cute box. Thanks for including a video.